Then an entrepreneurial caveman would of course have sauntered into a large feast of some sort, smiling graciously, showing people the axis he’d made for fitting two wheels together. He’d leave that night with a bellyful of goat meat and contracts signed in flint. “Sure”, he might’ve said, “the first wheel was great and everything, but I have this totally fantastic idea: let’s see how far this can take us. I’m sick of walking. Aren’t you all sick of it?” To which he’d get firm nods from those closest, curious peeking from those at the back. They’d be interested to see what ideas he had in the long run. A few people might’ve spoken up against the idea of two, or even four wheels, replacing what they knew, what they were just getting used to. But this stone-age salesman would’ve been right on the money – getting the ball rolling, in more than one sense, for the sheer hell of it. Drone technology has followed this hypothetical standard of prescient thought ever since models began hitting the shelves en masse. If the single wheel analogy is applied to commercial UAVs for the everyday consumer, then it took the gung-ho invention of operators in various industries to reach the two-wheel stage; or, more simply, the inevitable next step, the point at which the benefits of a product are inarguable, and thus destined for a revolutionary impact on the porous surface of our lives. It’s the same logical leap from Nokia handsets to Steve Jobs unveiling smart phone technology in 2007: a concept that’s cool and useful evolving into a multi-armed beast of proportional benefits for anything you can reasonably think of. Just as smart cars and smart cities are becoming an accepted reality, so too will commercial UAVs power into the public consciousness as staples of modern ingenuity. Associating drones with military services is already out of date, according to market trends. UK Business Insider reports that commercial drone revenue is forecast for a 19% rise over the next five years, compared to 5% for its military counterpart. By 2025, drone investment in the American commercial sector is predicted to surpass $5 billion. The flexible, cost-saving benefits of UAVs have been established – it is the move from being looked after at all times by a diligent operator, to navigating the skies and each other with near-total autonomy, that will enshrine them in the open pocket of the corporate toolkit. On top of this, drones will be able to process and manage larger chunks of data with little effort, accessing the currency that’s most often signposted for bettering our world. Regulation, admittedly, has been slow to catch up with them. Stories of drones crashing on the White House lawn and MI5 agents scrambling at an innocent airborne payload litter the black rabbit hole of speculation: what if a drone does this, or this, or THIS??! Accordingly, federal bodies everywhere have different idea on who can fly a drone, where, and to what purpose. Such confusion may get ironed out as society accepts that a buzzing sound overhead does not mean imminent death. The Atlantic published a brilliant article recently on this very threat, investigating a range of detection systems that can alert people to unknown aircraft. Whatever advances are squeezed out of mass UAV demand, there is a need for governments to respond, keeping a close eye on the technology, giving support freely to operators and the public without supressing long-haul drone flights. Similarly tricky is guessing exactly where the fattest industry growth will occur. 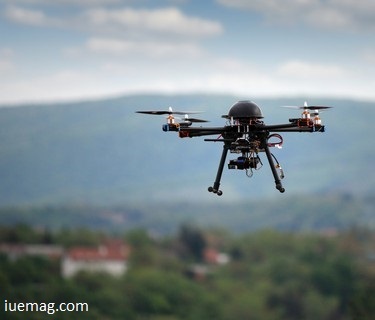 Land-mapping and surveys is at the forefront, since drones for these purposes have established sensor capabilities, and can connect to smart phones and the internet. Pathfinding, environmental awareness, adaptive A.I. . . . . these are features that are being honed by an armada of talented programmers, primed for the seamless storage and communicability of cloud data to round them off. The scope and simplicity of UAV development is a hungry, darting piranha of myriad prey, snapping up the most commonplace and bizarre possibilities that are open to us, wafting between competing pools of thought. What’s certain is the monetary backbone of these sleek machines has made them strong, capable, and ready to swallow old perceptions. We never realise the obviousness of new inventions until they sit with us, strangers no more, like a pet you’ve grown to love after it’s tested its claws on your furniture. Like I said, who really wants a wheel? There’s a Bentley outside.